As humans, we rarely encounter these exotic creatures of the sea. 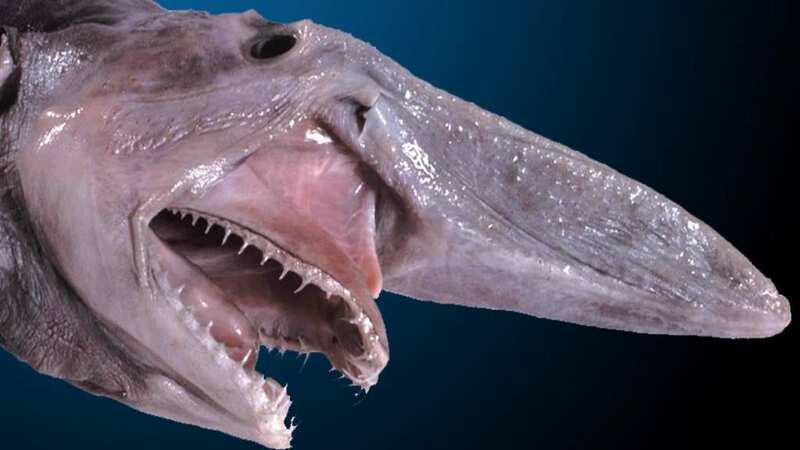 However, thanks to modern technology and the human hunger for knowledge, recent years have exposed some of the most eerie and deadly living beings that reside beneath the ocean surface. 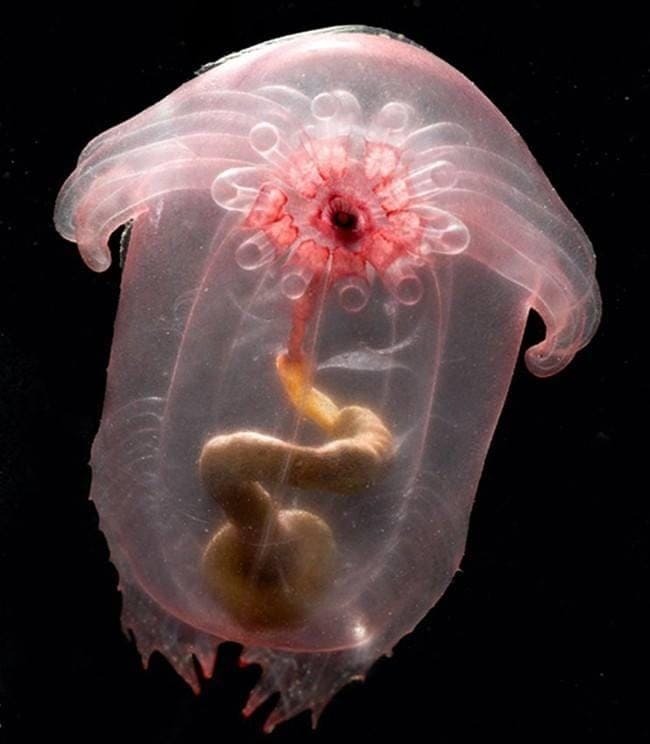 Initially discovered back in 2007, the Pink See-Through Fantasia was spotted at a depth of approximately 8,200 feet in the Celebes Sea, a remote area of the western Pacific Ocean bordered by Sulu Archipelago, Mindanao Island of the Philippines, the Sangihe Islands, Sulawesi, and Indonesia. This creature is a type of sea cucumber and its mouth and intestines are all visible from outside, hence its name. This species can emit light, and when in danger, it uses that same light to alarm other predators. 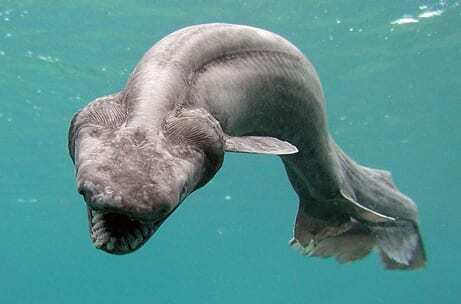 Perhaps the biggest mystery that lies in the oceans today is the frilled shark, as spotting one is so unbelievably rare. Swimming at about 5,200 feet, these sharks grow to a maximum length of 7 feet. Having extra gills, big mouths, eyes on the sides of their heads, spineless back fins, and an unusual arrangement of vertebrae all point towards the most ancient groups of sharks still in existence. Frequently referred to as a “living fossil”, paleontologists believe this Frilled Shark can be tracked back to 300 million years ago. This African freshwater elephant fish uses electrolocation to find prey, and has the largest brain-to-body oxygen use ratio of all known vertebrates. Usually found around Central or West Africa, this fish prefers muddy, slowly moving rivers and pools with cover such as submerged branches. As its name suggests, the fish’s most striking feature is a trunk-like protrusion on the head. Although not actually a nose, this part is actually an extension of the mouth, used mainly for self-defense, communication, navigation, and tracing food. The Oxford Dictionary defines Lampreys as “an eel-like aquatic jawless vertebrate that has a sucker mouth with horny teeth and a rasping tongue. The adult is often parasitic, attaching itself to other fish and sucking their blood.” Resembling a snake more than a fish, this creature can be more than a meter long. 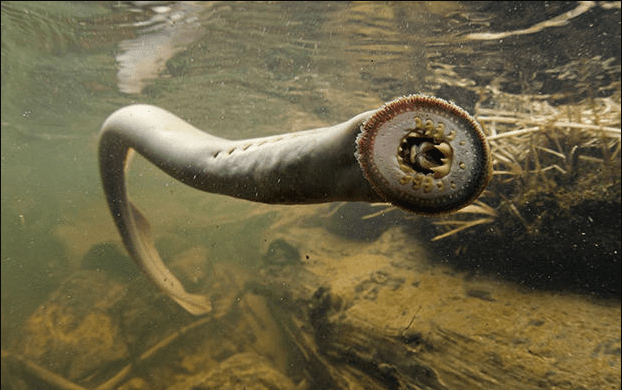 What is especially extraordinary is that they have been around since well before the dinosaurs, and with 360-million-year-old fossils looking exceptionally like modern lampreys, they are said to be the oldest vertebrates. Like many deep sea fish, red-lipped batfish are voracious carnivores. Most commonly found around the deep waters of the Galapagos Islands, the habitat for this batfish is deep waters. This out-of-water seeming fish has plenty of features that are very un-fish-like. For example, its pectoral and pelvic fins are modified in such a way that it can rest on the sea floor on them, as if it is sitting or walking. 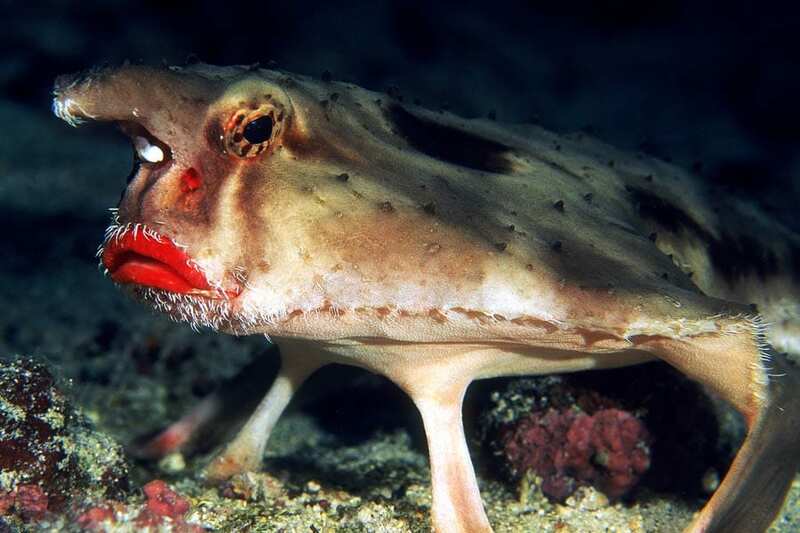 The maximum length of the Red Lipped Batfish is about 16 inches long. Oarfish are large, greatly extended, pelagic lampriform fish. Found in all temperate to tropical oceans yet rarely seen, the oarfish belong to the small family Regalecidae. Since their flesh is not well regarded for eating due to its gelatinous consistency, the larger species are considered game fish (caught by anglers for sport) and are fished commercially to a minor extent. Since they have no visible teeth, the Oarfish feed primarily on tiny euphausiids, shrimp, small fish, jellyfish, and squid. 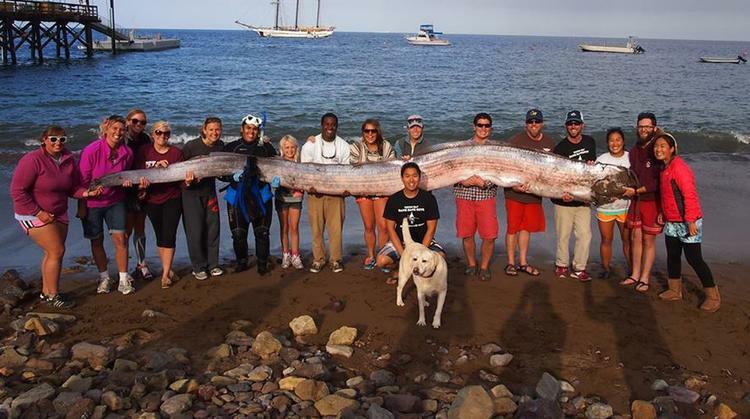 Oarfish have the longest known length of any living species of bony fish. Found in both tropical and temperate waters, the giant hatchetfish has been seen in all of the world’s oceans except for the North Pacific. However, “giant” is used in relative terms only, as it is the largest species of marine hatchetfishes, often exceeding 4.3 inches standard length. 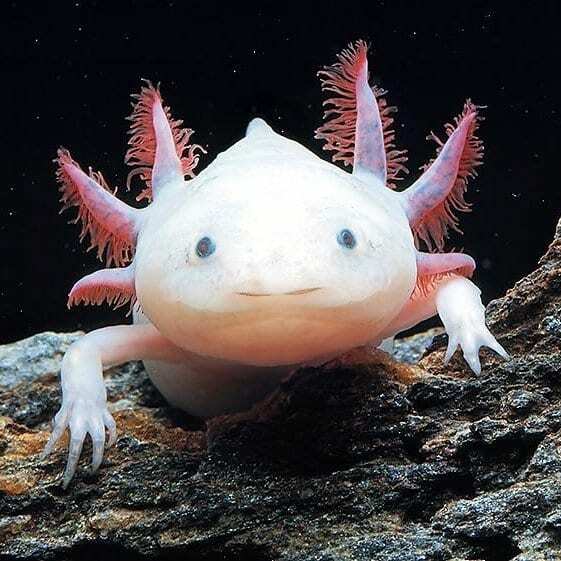 Only found in one complex of lakes close to Mexico City, this medium size amphibian is able to regenerate limbs that become damaged or detached, meaning that axolotls have been extensively used in scientific experiments around the world. The axolotl is a carnivorous animal, feeding on mostly worms and insect larvae. The axolotl can live for up to 25 years, however, the average axolotl rarely gets much older than the age of 15. Although technically endangered, the axolotl is kept as a popular freshwater aquarium pet all around the world. The Squidworm was granted its name since it has 10 tentacle-like appendages on its head. 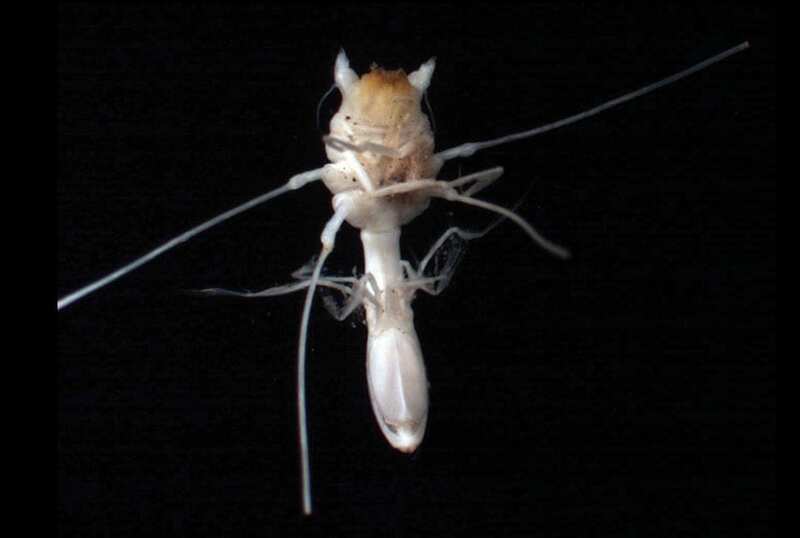 These appendages are each longer than its whole body, which proves useful as it uses these to collect particles and detritus falling through the water – often called “marine snow,” for food. Naturally, this means the Squidworm is not a predator, despite its alarming features. 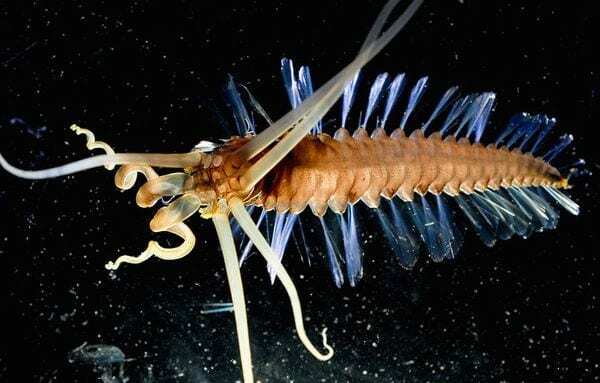 This rare creature is believed to act as a “transitional organism”, with physical and behavioral characteristics of both benthic (seabed-dwelling) and pelagic (free-swimming) organisms. 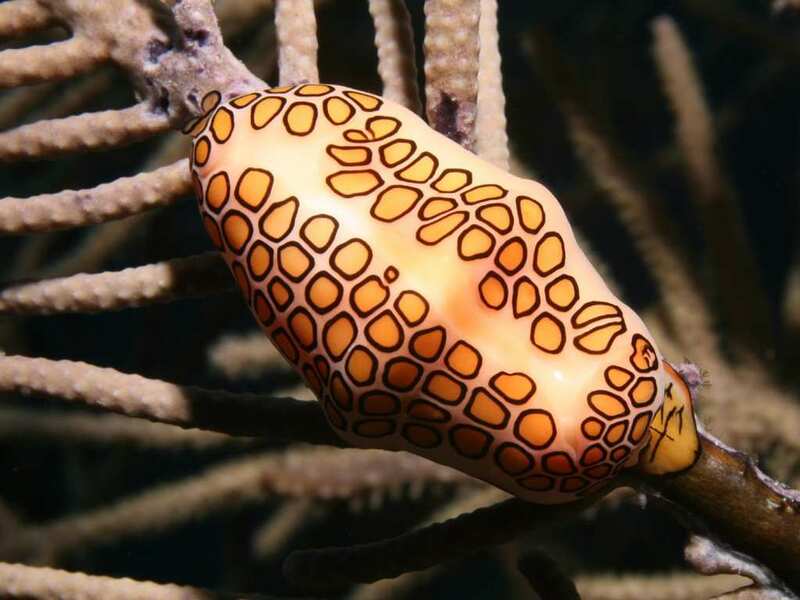 While the Flamingo Tongue Snail has historically been abundant throughout the Caribbean, there are now concerns over its declining population – divers and snorkelers are fascinated with the snails’ shells, and therefore take the shells as souvenirs. Unfortunately for all, what these people do not understand is that the snail’s orange-yellow spots are part of the animal’s living tissue, meaning they disappear when the animal dies, and all that is left is a plain white shell. 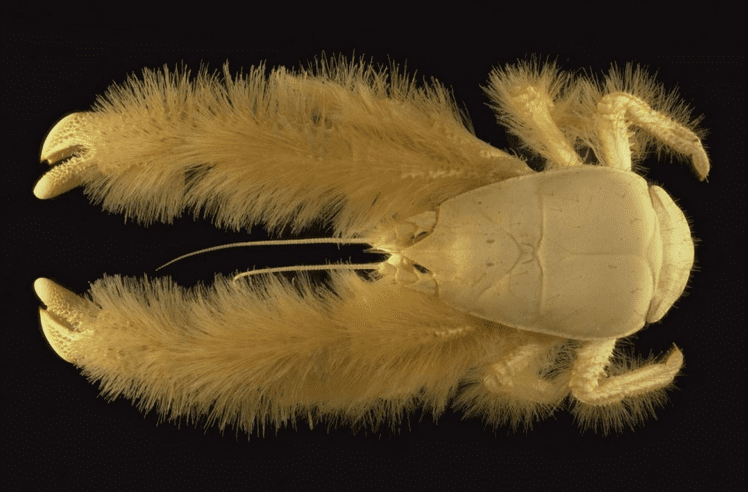 Known to reside in the Southern Ocean, a little off crisp Antarctica, the “Yeti” crab is white, blind and covered in hair. The latter feature is said to be a form of adaptation to the creature’s habitat, also done through its chosen residential space – it lives near the thermal vents in the ocean floor, where hot water gushes into the sea. These crabs survive by growing their own food on their own body, as their hair serves as a “garden” for bacteria growth. This amazing specimen is truly one of a kind, being able to gather iron sulfide and thus build a shell out of iron. Bacteria is the enabler for this spartan armor. As if that isn’t enough, the foot (aka the squishy part that protrudes out of the shell) is covered with iron plates, too. No other animal on Earth can utilize iron this way. 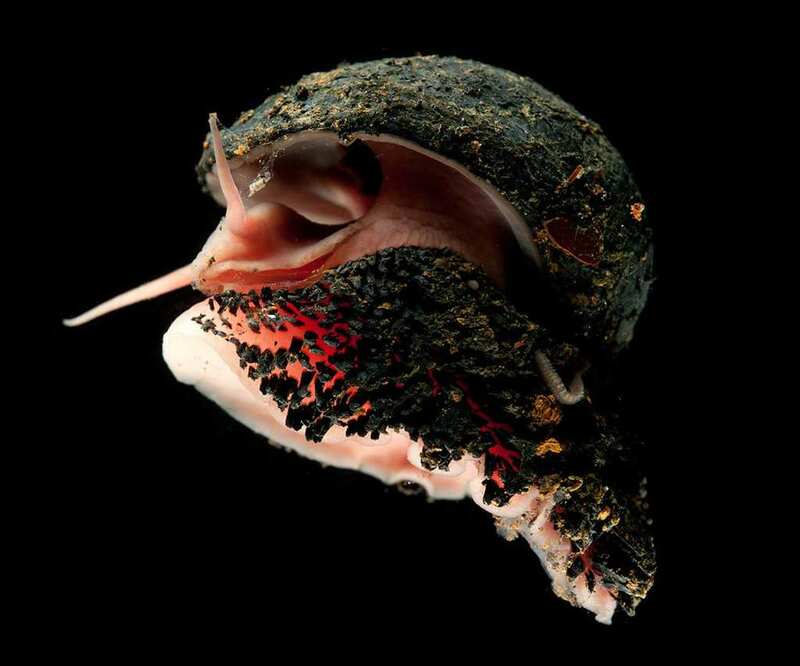 These snail are mostly found around hydrothermal vents, where seawater is heated by underlying magma, reaching 750 F or more. This is an extremely demanding habitat. Living on tropical coral reefs around the world, this type of worm is sedentary, meaning it is somewhat inactive as once it finds a place it likes, it pretty much stays put. These worms aren’t very big (about 1.5 inches in length), but they do come in a variety of bright colors, and when combined with its distinctive shape, these Christmas Tree Worms make an easily spottable prey. 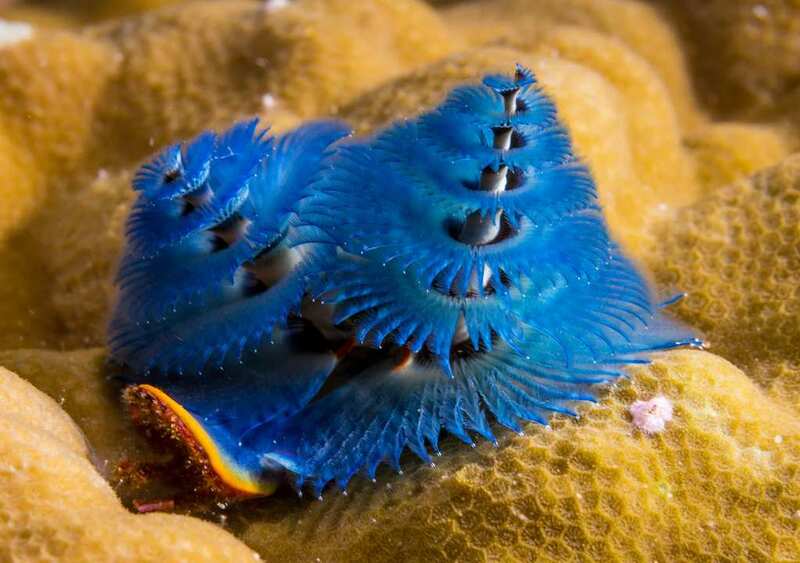 When startled, Christmas tree worms rapidly retract into their burrows, hiding from predators. Known as the naked sea butterfly, the Sea Angel (or in its scientific name, Clione limacina) lives in the Arctic Ocean and cold regions of the North Pacific and North Atlantic Oceans. 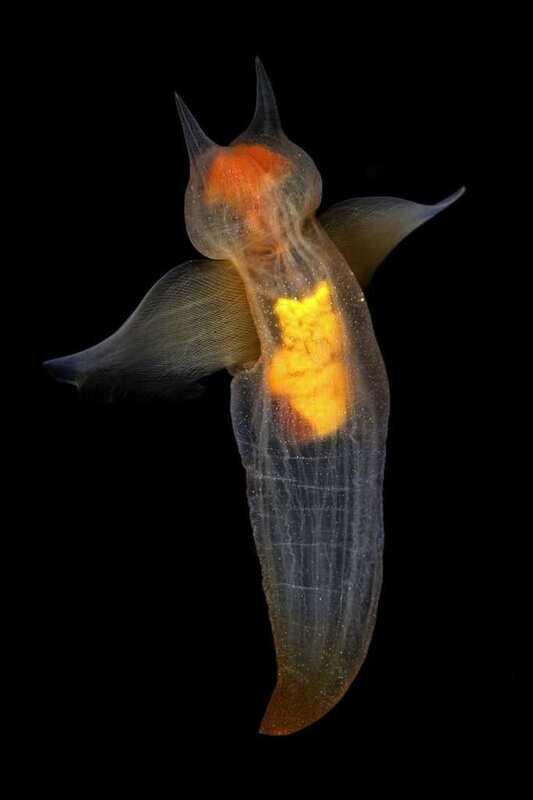 With a life expectancy of at least 2 years, the Sea Angel was first described by Martens in 1676 and became the first shell-less “pteropod” (sea butterfly) to be described. Because of their appearance and singularity, it is hard to believe they are related to snails. Continuing with strange and different relatives, this genus of isopods is related to woodlice. Munnopsis Isopod swims around in the darkest corner of the deep sea, stretching their 0.5-1 inch bodies and lounging about the sea bed. Feeding off floating bits and pieces around the sea, the Munnopsis likes to travel and does so relatively easily, despite having little to no eyesight and a shrivelled bone structure. Effortlessly drifting around in the big blue, the Munnopsis lays hundreds of eggs and is not a highly desired or convenient prey. Having eight arms of unequal length, the longest extending to about 14 inches, those same arms typically weigh around 13 pounds. 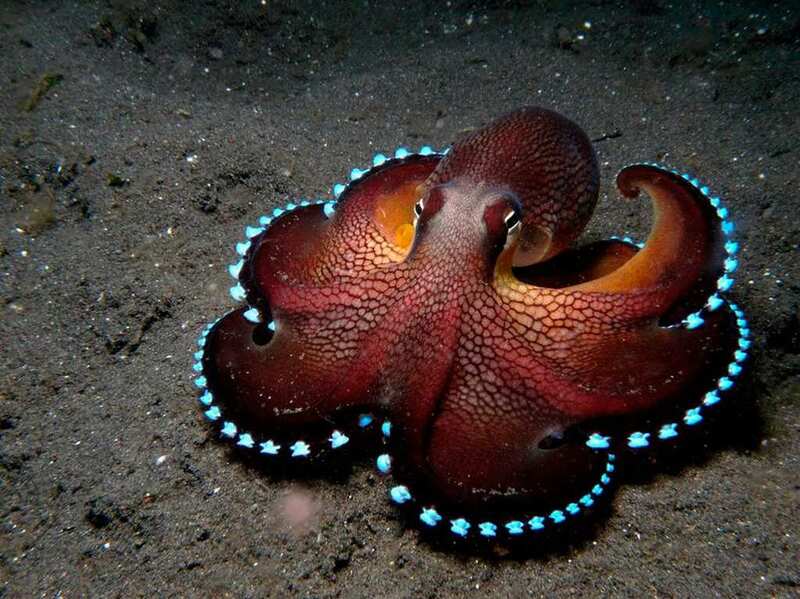 The Bioluminescent Octopus emits a blue-green light, yet does not do so continuously. It can do so for a period of five minutes after suitable stimulation. Found in the North Atlantic Ocean, this octopus is usually found a few hundred yards from the bottom of the ocean, at depths between 4,900-8,200 feet. Feeding off shell, mussels, crab and lobster, this animal is known for swallowing its food whole. Also commonly referred to as sea cucumbers, the Holothurian comes in various shapes, colors and sizes. 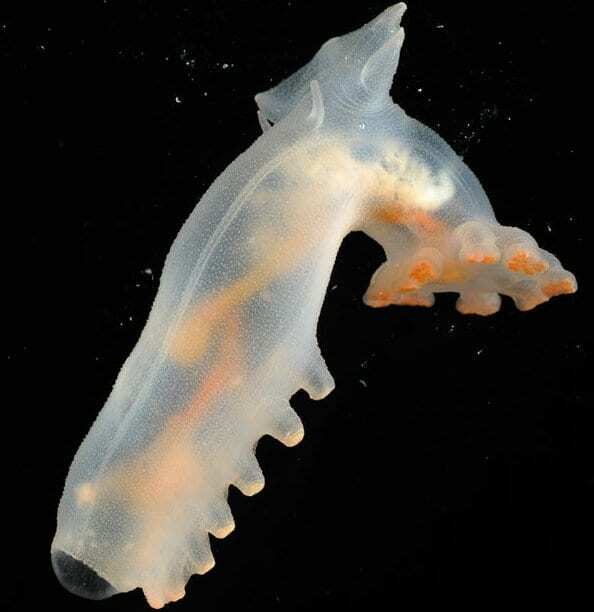 This particular Holothurian, showed in the image below, is a pale and transparent one, caught at approximately 8,000 feet below sea level. Sea cucumbers are named after their resemblance to the fruit of the cucumber plant and are found on the sea floor worldwide, their leathery skin and an elongated body. Overall, there are over 1,700 species of Holothurians worldwide, the greatest number being in the Asia Pacific region. Its name being a loose translation from the originally granted name, Dinochelus, and indeed this lobster has not one, but two terrible claws. Unlike sea creatures that lay deep down below sea level, this lobster maintains pretty good eyesight. This photograph may suggest the lobster is pink, but it is actually more white than anything else, the reddish-streaks throughout its body are shown due to the transparency of its shell. This lobster was found by trawling at a depth of around 820 feet in 2007. 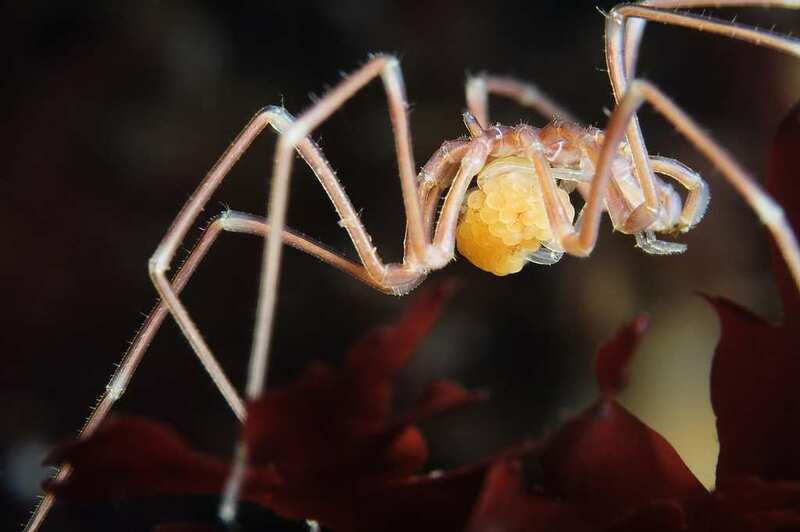 As could be inferred from its label, Pycnogonids are creatures which live in the sea, and have almost no body or proboscis, as they are mainly pairs of legs. These spiders could be found all over the world and at ranging depths, yet they are more often spotted in shallower waters. Each of the 4-6 legs can be as short as a few millimeters or as unimaginably long as 2.8 feet. Generally, there are about 1,000 species of sea spiders known to science. 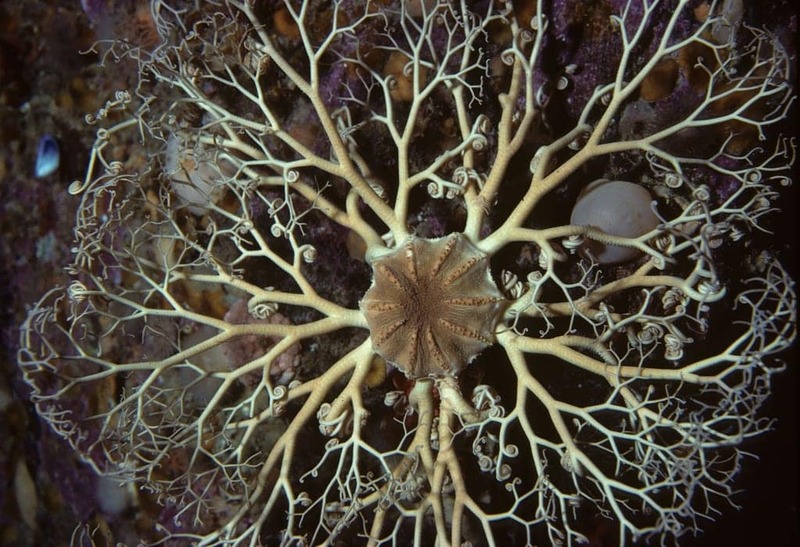 Basket Stars are a group of exceedingly peculiar Brittle Stars, and just like the latter, the Basket Star has 5 arms sprouting from its central disc. Then, each arm branches out over and over again until a sort of basket is formed. 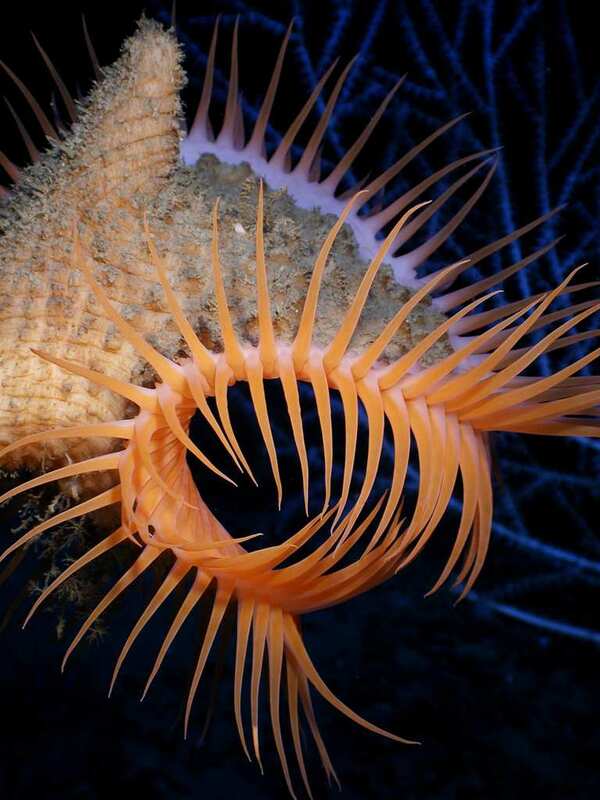 These flexible tendrils have a top layer of leathery skin on their arms, meaning that if torn, just like us humans, the Basket Star will be injured and a vertebrae-like ossicles will be revealed beneath. Also, watching their eating ritual is quite the grotesque yet can’t-look-away sensation. Polyorchis or “Bell Jellies” are actually not a true jelly, despite the resemblance. 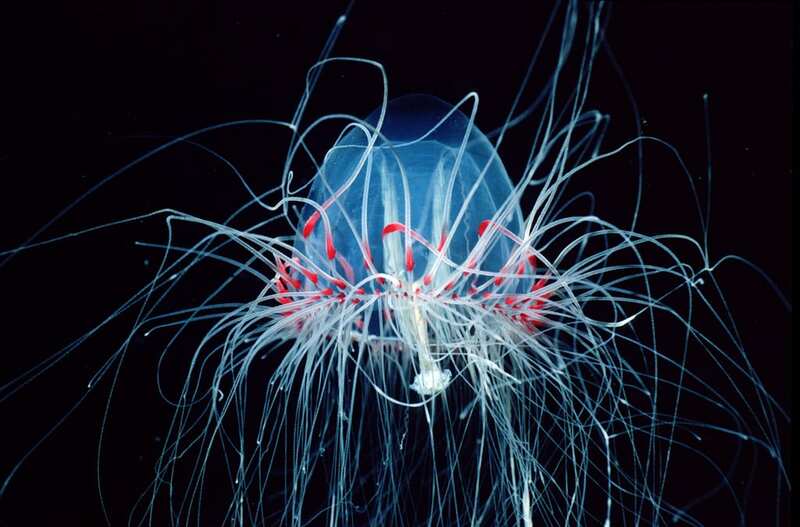 Polyorchis are actually a hydromedusae, a class of very small, predatory animals, most living in salt water. The Polyorchis are transparent with red coloration in their internal organs and eyespots around the rim of their bell. The red pigmentation helps them camouflage. They are often found in harbors, marinas, and other calm waters close to shore. They feed on plankton and benthic crustaceans and are found near the sea floor. Though the males seem to be around the same length as females at that maturation stage, towards their elderly years the females are significantly longer – by almost 8 inches. This fish was considered to be a shark, but its character suggested otherwise – this species has had one documented case of an attack on a diver, when a male guitarfish was interrupted during mating. However, because of the tooth structure of the guitarfish, this attack could have resulted in a “gumming” at worst. These small creatures may seem beautiful to touch, but actually, the more vibrant its colors are, the stronger signal it is sending you to stay away. 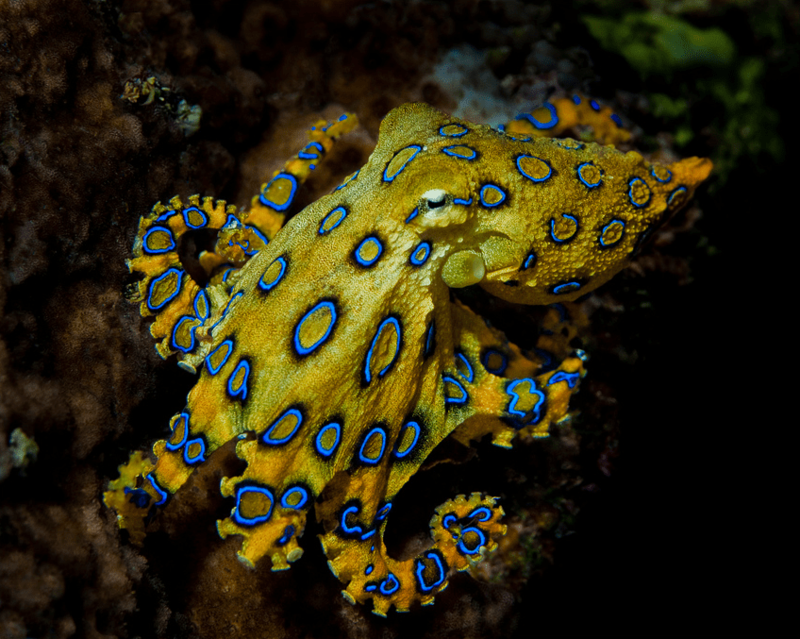 Found in tide pools and shallow waters from Japan and all the way down to Australia, these Blue Ringed octopuses are hunters, using muted reef tones to blend in and a brilliant yellow with iridescent blue rings to give out a warning about its toxicity. Their bites have caused more than seventy recorded fatalities in Australia. Anemones may put a smile on our face when watching Finding Nemo, but this creature is an intelligent, deceitful and threatening species. To the unexperienced eye, this pastel-themed body with brightly colored disks may seem like a plant, but it is actually an animal. These sessile, benthic animals can be found in warm waters of the Atlantic Ocean, yet easily adapt almost anywhere. The Venus flytrap anemone gets its name from its appearance and how it feeds. The Harp Sponge is a species of a carnivorous deep-sea sponge first discovered off the Californian coast living at depths of 10,800–11,500 feet by the Monterey Bay Aquarium Research Institute. This creature captures copepods, crab, lobster, shrimp and more by using its velcro-like hooks on external body surfaces. Once the hooks have seized its prey, the sponge excretes a digestive membrane that surrounds the captured prey, breaking it down until the sponge can absorb it through its pores. The coloration, snout and tooth structure of Goblin Sharks is what makes them extremely unique and easy to pick out of a crowd. The shark’s color varies between grey with a hint of pink, to a full on bright pink tone of skin. The reasoning behind this less-than-suiting feature is that this shark’s skin is so transparent, that enables us to see the oxygenated blood within their capillaries. The majority of these sharks that have been caught were at depths of 200-920 feet off the shores of Japan. 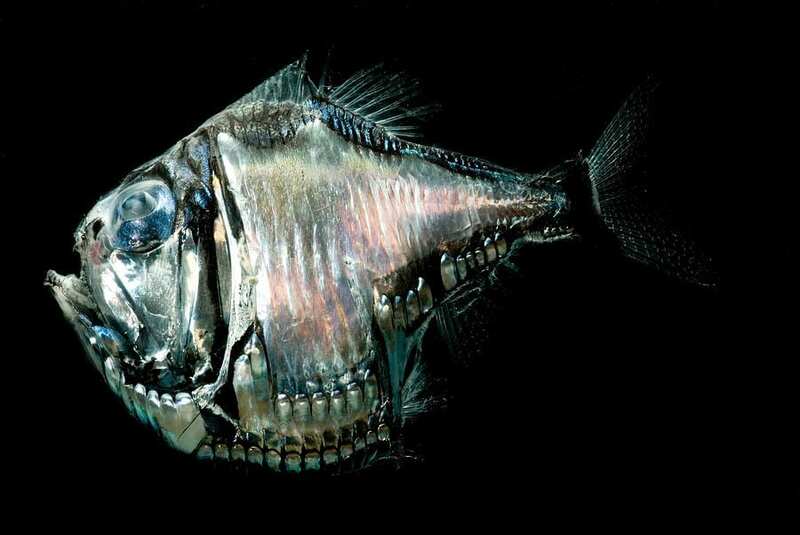 Found at the depths of up to 10,000 feet below the surface, this fish is known to bite off more than it can chew – literally. 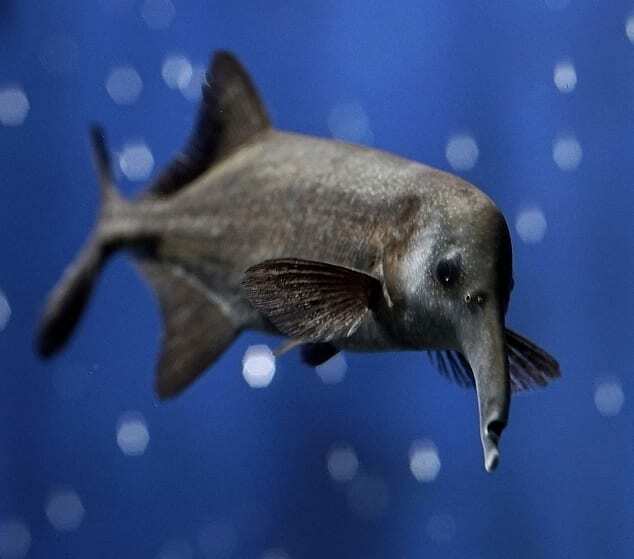 An average black swallower measures approximately 10 inches long, but the fish strategically swallows whole animals twice its length and ten times its mass effortlessly. 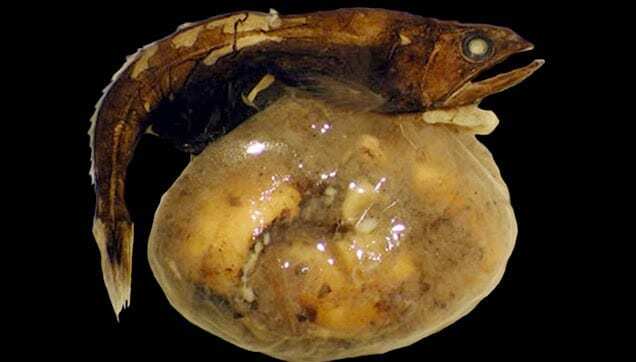 Unfortunately for the Black Swallower, when it eats more than it can handle, the food in its stomach begins to decompose before having the chance to be digested, causing its stomach to burst and the Swallower to die instantly. Natural selection was kind to this phenomenal creature, which is both exquisitely camouflaged and highly majestic. This fish belongs to the same family as seahorses and pipefish, and resembles its relatives through physical attributes. 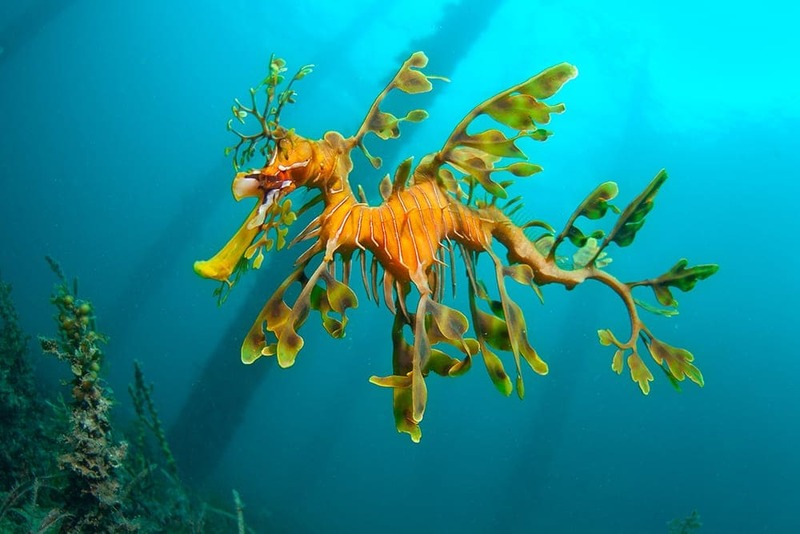 Usually, Leafy Seadragons are yellowish-brown to green in color, although this will vary depending on their age, diet or location. As their name suggests, there are a number of leaf-like appendages along the body, which help to make these fish resemble the seaweed around their habitat. This large, orange, deep-water Arctic, colonial jellyfish exceeds 3-6 feet in length, with an additional nectosome (swimming end) usually up to 10 cm. 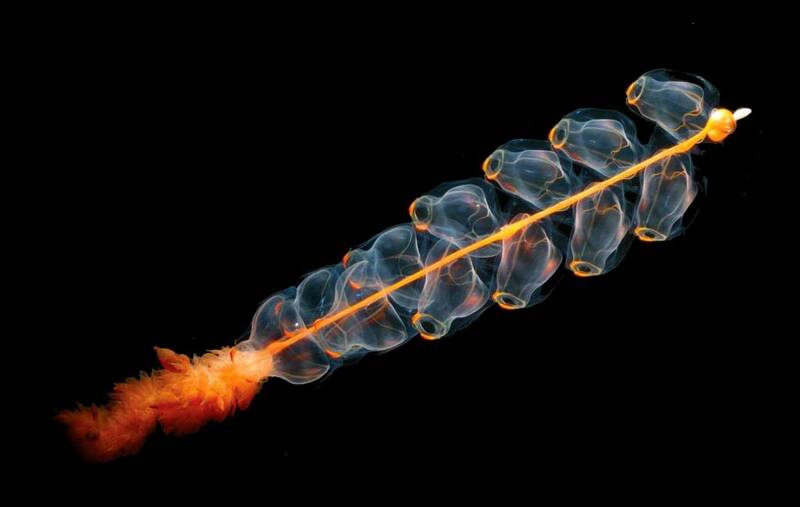 As a species of pelagic siphonophore, this animal is composed of a complex arrangement of zooids, some of which are polyps and some medusae. In the front of the Marrus Orthocanna is what is known as a pneumatophore, which is filled with an orange colored gas, used for buoyancy. They primarily feed on small crustaceans, such as krill and decapods. 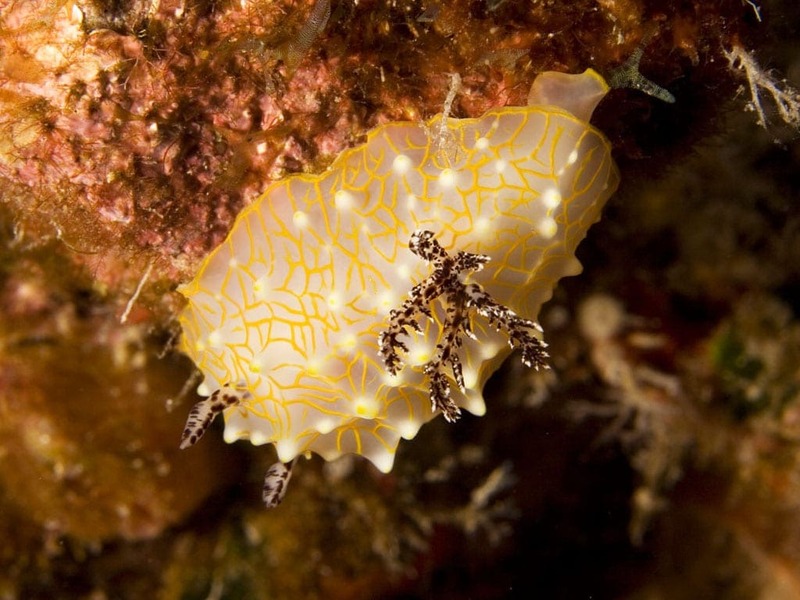 Only 2 inches in length, the Golden Lace Nudibranch is an endemic species to Hawaii. 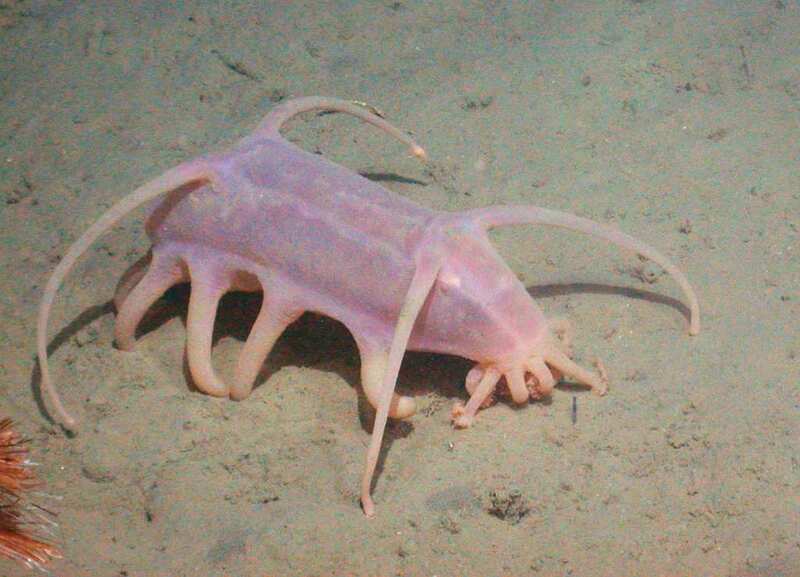 Feeding on sponges, bryozoans, tunicates, bristle worms, and other sea slugs, this creature is found at depths ranging between 15 and 100 feet. With its intricate network of gold lines stretching across its body, little white bumps called tubercules, and black and white speckled gills and rhinophores (their sense organs), these sea animals are known for their unique physical properties that make them especially striking to both divers and scientists alike. 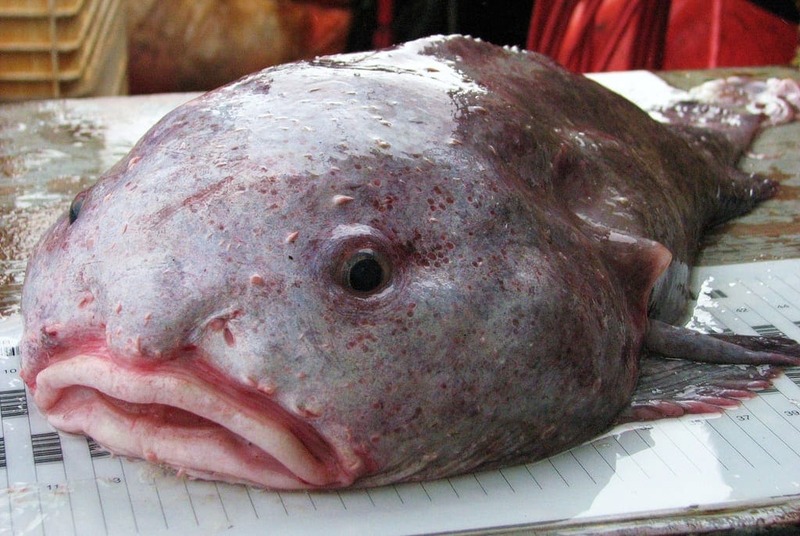 Also known as Blobfish, Blob Sculpins are probably the most bizarre sea creatures detected by man. 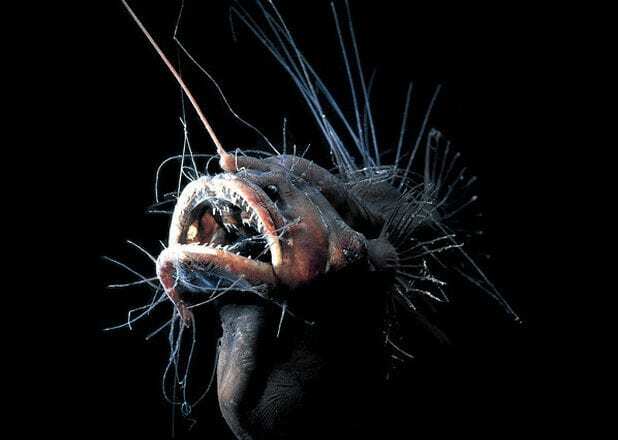 Their local habitat consists of the deepest waters where they lie in utter darkness, surrounded by water temperature of either 50 F or less, the pressure being unbearable for most living organisms. This is probably why humans do not usually come across this species. Unable to swim, this type of fish mostly floats in the water and every now and then opens its mouth to feed on whatever comes its way. 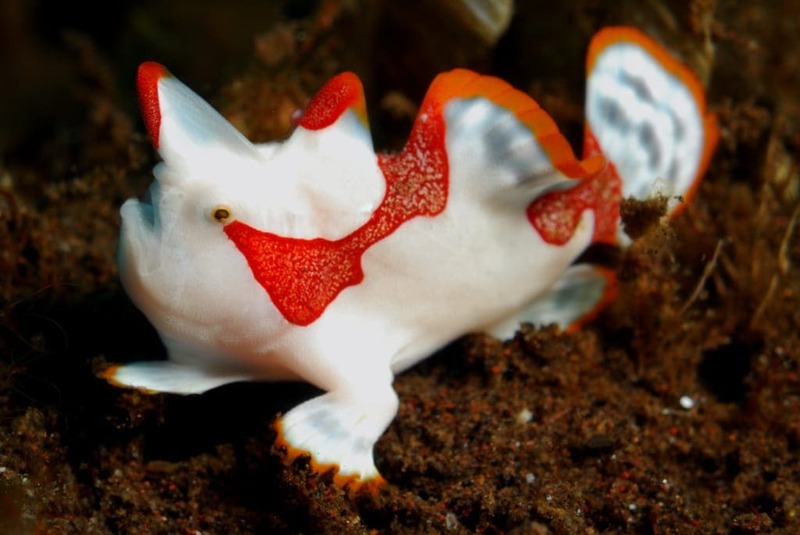 Clown Frogfish can be found in the tropical Pacific, Eastern Atlantic, Eastern Pacific, Hawaii (Kona), Indian Ocean, Japan, Red Sea, Tropical Australia, Western Atlantic, Indonesia and Asia, the Frogfish takes on many different color. These lie-in-wait predators are equipped with a lure, and when an unsuspecting creature sees the lure and swim towards it, roles switch and the predator becomes the prey. Oddly, Frogfish move very slowly but ironically, frogfish have the fastest strike speed of any other animal on earth. 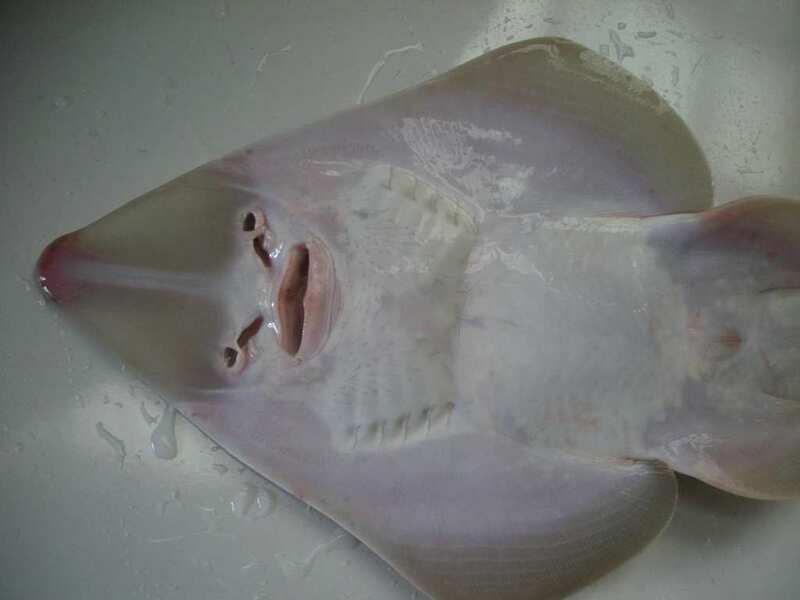 Because the creatures live at such great depths, they’re rarely seen alive and little information is gathered about their way of living – but enough has been revealed about this creature to know that it is the stuff of nightmares: the Fanfin Seadevil reproduces by having the males fusing their bodies to the females’ until they essentially become one. In fact, the male loses his eyes, fins, teeth, and some internal organs and, from that point forward, lives off of the female.